1. Indented style: It is the oldest style of writing business letters. In an indented format letter, the first word of every paragraph is written leaving some (two or four) spaces from the left margin. Other parts are arranged- date is right margin, inside address left margin, subject is in the middle of two margins and complement close in the right margin, etc. 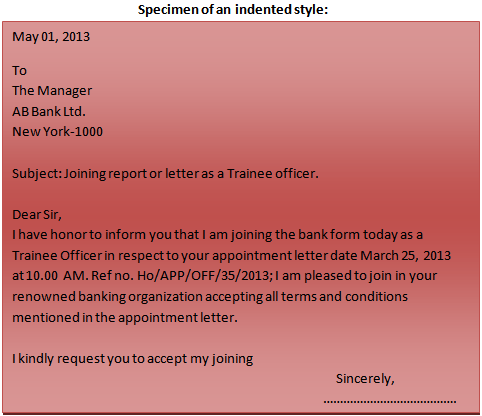 It is the popular and easiest style of formatting business letter. 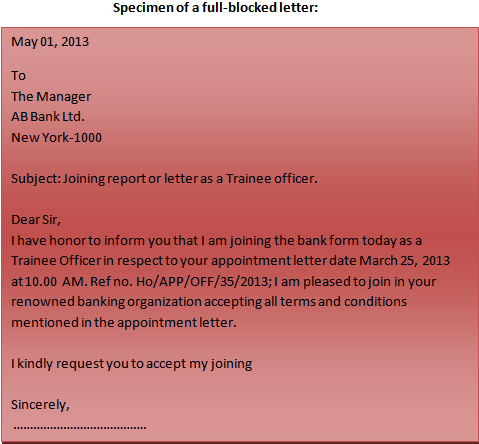 In a full block format letter, all text or part is aligned or starting from the left margin. Paragraphs are not indented. Therefore, no time is lost in typing adjustment. 3. 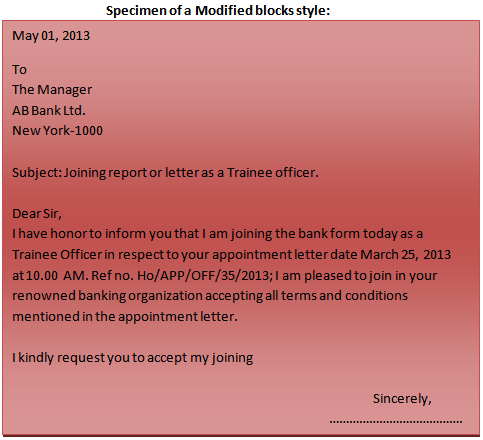 Modified block style: It is also very modern and popular style of formatting business letter. It is just like the full block style with two exceptions (date and complementary closing). 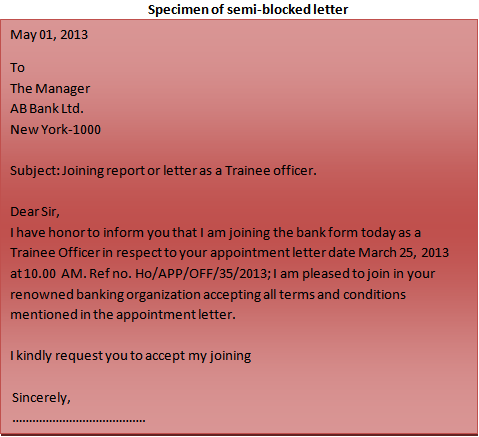 In a modified block format letter, all text or part is aligned to the left margin, except for the date and complementary closing (with signature). Paragraphs are not indented. 4. Semi-block or Semi-indented style: In a Semi-block format letter, all text is aligned to the left margin, paragraphs are indented. It is the combination of indented and block letter format. In this form inside address and complementary closing are written in block style (left margin) while the body of the letter is written in the indented style. Paragraphs are indented three to five spaces. 5. Hanging style: In a Hanging format letter, second and subsequent lines of a paragraph start leaving one or two words from the first word of the first line. Here parts of the letter can be arranged according to the block or indented style. This style is identical to the semi-block style with one exception. Instead of the first line being indented all other lines in each paragraph is aligned with the left margin. It is not usually used in everyday business communication.